It’s no secret that I love Gretchen Rubin, the author and podcaster who discusses happiness and human nature. Most of her tips and strategies are for home life but I started thinking; could these also apply to work? Gretchen designed Power Hour to tackle non urgent tasks that were weighing on her mind and sapping her energy, in an hour once a week. As a productivity nerd, I was explaining the concept of Power Hour in a retrospective (I’m the delivery lead for the marketing team) and they started giggling, so as punishment, I blocked out an hour one Wednesday morning for us to try it. I redesigned our Power Hour to tackle any type of task, any size. Our to-do list on the kanban board was filled with tasks we kept de-prioritising as more important things kept coming up. We came prepared to the first Power Hour with a list of tasks to tackle from the kanban board, put our heads down and tried to complete as many as possible. The first session turned out to be a hit and we now do this every Wednesday morning, before standup. “What kind of tasks could be done?" Coffee. The regulars usually send me a panicked message on Wednesday morning, worried they’re too late for the coffee order. When I get to the office, my protégés are raring to go (either that or they’re just waiting for coffee). We usually park ourselves in the kitchen (which is also a shared workspace), on the table with morning sun. Our colleagues potter around us, making their tea/coffee, wondering why we are huddled together, madly typing and sipping our (superior) coffee. 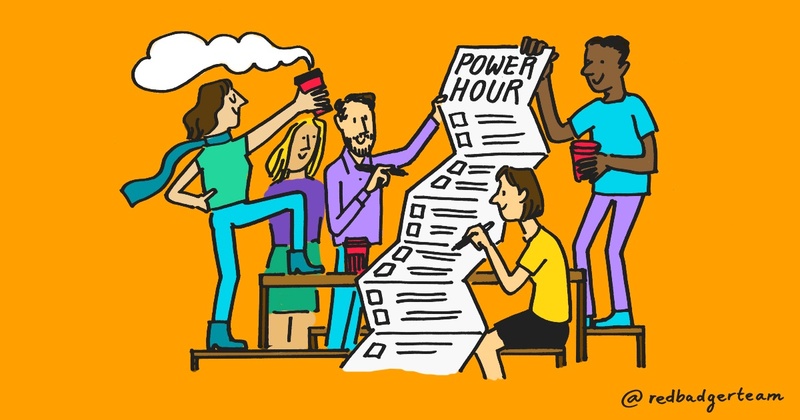 “Power Hour has made me a better person"
Power Hour has been a fun and productive addition to our work week. It can be altered in any way you see fit; there are no rules! I challenge you to try it at least once. Let me know how you go.